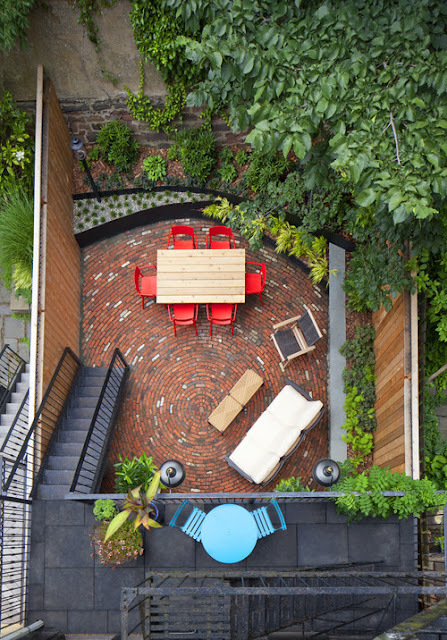 The urban backyard is a very specific problem and I tend to collect ideas for them as I wander along, but this photo just stopped me in my tracks. I've never seen a whirlpool arrangement of bricks before and I love how they mirrored the planting beds to go with the flow. Extra points for creativity. I think its interesting they used just greens rather than flowers to fill out the landscape. Perhaps to make the red of the bricks and chairs stand out? Or maybe they just didn't have the right light to grow flowers? But it comes off as a little cool to me without anything but green plants. 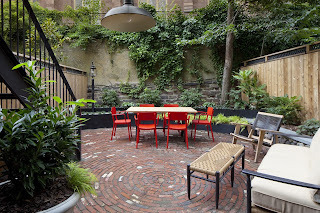 Follow my urban oasis board for more small space city backyard inspiration. This is awesome. But it makes my tile saw arm hurt just looking at it. I know right? It must have been a lot of manual labor to get it so perfect looking. Speaking for someone with a similarly small sized back yard, you don't learn to rollerskate at home here. You just walk over to the park and play there. So something like this makes a lot of sense here where backyards are more for entertaining than sports. Makes a gorgeous background to use a specific color flowers for an occasion. Can you imagine this in the evening with a few strings of Edison bulbs providing a soft, relaxing mood? Oh yes. Lights would make this lovely. Love creative thinking like that. It makes for a spectacular overhead view. It looks like a shady spot so I can understand all the greenery but lighting in the garden and overhead would be a good addition, as well as some container plants you could move in and out of the light if needed. Thinking about it - its likely these photos were taken after the design firm finished building it - so they need got to see the plants mature. So maybe its a lot brighter now? I gotta have some flowers! Several flowering plants love shade. Impatiens and begonias would do very well in this shaded garden. A climbing Hydrangea (has large white blooms) on that back wall would be spectacular. I love foliage that is variegated or lime green but I've got to have at least one flowering plant. Vikki in VA.
Love it. A fire-pit would be so much fun here. The older I get the more I love all the greens in my garden. Having lived in the country all my life though, I'd have such a hard time with no green space at all, just hard-scape.